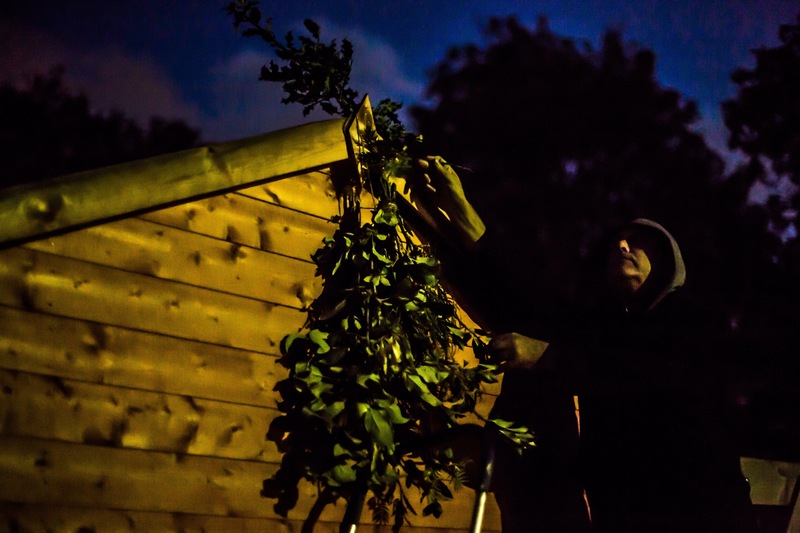 Cultural Forager, artist and poet, Paul Conneally, anoints a garden Shed during Conneally and Culhane’s ‘Topping Out Kiss the Gable’ ritual performance piece at Loughborough University Fruit Routes Harvest Celebration. The shed stands on the LANDSCAPING AND GARDENING SOCIETY plot at Loughborough University and was recently erected to replace the original shed which was burnt down earlier in the year. ‘TOPPING OUT Kiss the Gable’ is based on the ceremony of Topping Out that builders undertake when the highest point of a building is completed. 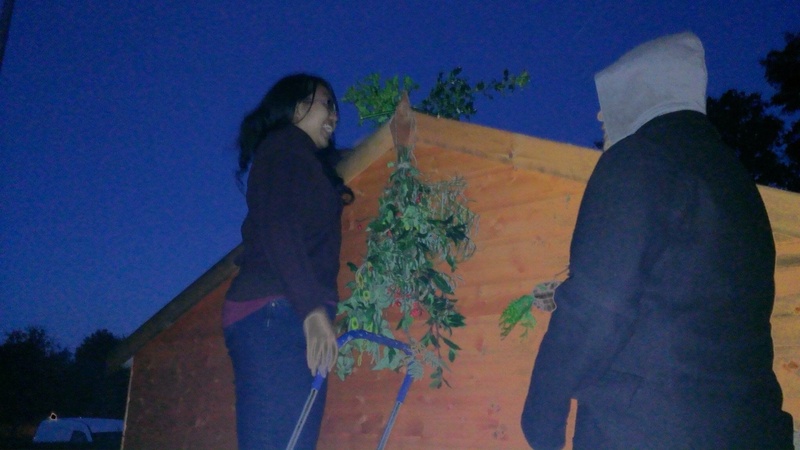 In Conneally and Culhane’s version, switches of tree and other plants are bound together and placed at the apex of the shed. The hanging plant material includes rowan, holly and bay twigs to ward of bad spirits and bring good luck to the shed and all who use it. Two ladders were placed against the gable and people at the Fruit Routes Harvest Celebration were invited to climb one ladder, kiss the apex of the gable and say a few words if they felt that they wanted to while at the same time being anointed by Conneally, who is up the other ladder, with Apple juice freshly pressed on site that afternoon. Artist Paul Conneally anoints a member of the public taking part in the Conneally and Culhane participation intervention / performance ceremony TOPPING OUT at Loughborough University Fruit Route Harvest event.